If you've used Google Earth to view your house from satellite imagery, you're going to love flying to places your ancestors lived, worked, or farmed. If you've yet to use Earth, you are in for a real treat. Google Earth is a free program that allows you to freely roam the planet via stunning satellite imagery and (in many instances) take an "on the street" stroll in your family's old neighborhood. Uses for Earth are many, but three of our favorites are using the program in conjunction with historical census addresses, cemetery locations and Bureau of Land Management data. Once you have an address, enter it into the Fly To box in Google Earth and off you go! But what if the place your family lived no longer exists? It happens. Street names change, old neighborhoods are razed for modern complexes, and stately mansions are chopped up into small apartments. The further back in time you go in urban areas, the higher the likelihood that your family's home was near today's inner city, thus more subject to development and downtown renewal projects. In one case of flying to a specific address during my own research, the family home was long-gone, replaced by a parking lot for a medical center. All is not lost, because one of Earth's hidden gems is the collection of Rumsey Historical Maps, available for some locations. You'll find the checkbox for these maps in the left navigation panel under Layers > Gallery. Make sure the box is checked and then fly to your location. If there are historical maps you'll see an orange-colored icon. 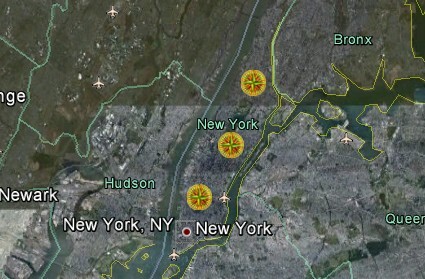 Click the orange icon, then click the sentence that reads: "To Overlay the Map on Google Earth, Click on Map Thumbnail". This will overlay the historical map on top of the modern-day image. Depending on the detail in the historical map you may be able to find the old street where the family lived. If your family lived on a farm, it's still possible to fly to the environs with just a street or road name. You may not be able to see the old homestead, but you can definitely fly to the neighborhood. During a research session, I found a reference to an abandoned cemetery where my great-great grandparents had been buried. When I tried to find the location using Google Earth, the program kept putting me into what looked like a stand of trees in the middle of cultivated farmland. So much for that idea, I thought. Even though I had a hard time believing this was the right location, on further investigation it turns out that Earth had taken me to the exact location of the cemetery; indeed, the tombstones were scattered through a small stand of timber. Earth had found what I had missed. On another occasion, after scouring the Internet for a family cemetery, I turned to Earth and it flew me directly to the little cemetery. 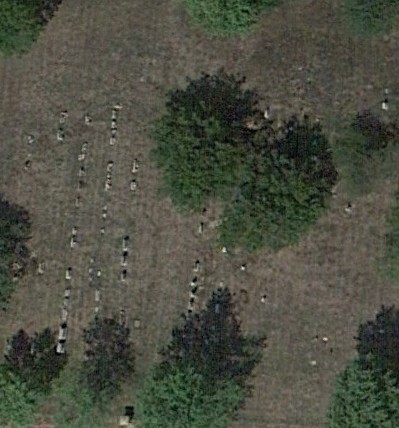 If you've unsure of whether you're looking at a cemetery, this image illustrates what an old cemetery can look like from above; note the uneven spacing and uneven size of the stones. When searching for your family cemetery or old burial ground, if Earth can't immediately find it, make sure you're searching in the right county. If you're not sure where the cemetery might be, first check the Geographic Names Information System (GNIS). Enter the name, Class (i.e. Cemetery) and state; hopefully the system will return not only the county name but also the GPS coordinates. If your ancestor lived in a public land state and was the original recipient of land from the U.S. government, you can find the records over at the Bureau of Land Management - General Land Office (BLM-GLO) website. Keep in mind that these records are only for the original transfer of land from the government to an individual; they will not contain subsequent land transfers. Using GLO records in conjunction with Google Earth you can fly to the parcel of land that your ancestor owned. How neat is that! 6. Fill in the blanks, then click Fly To On Google Earth. This will create a KLM file. 7. From Earth's main menu, click File > Open. Navigate to the KLM file that you just created and click to open. Earth will fly you to your ancestor's land. 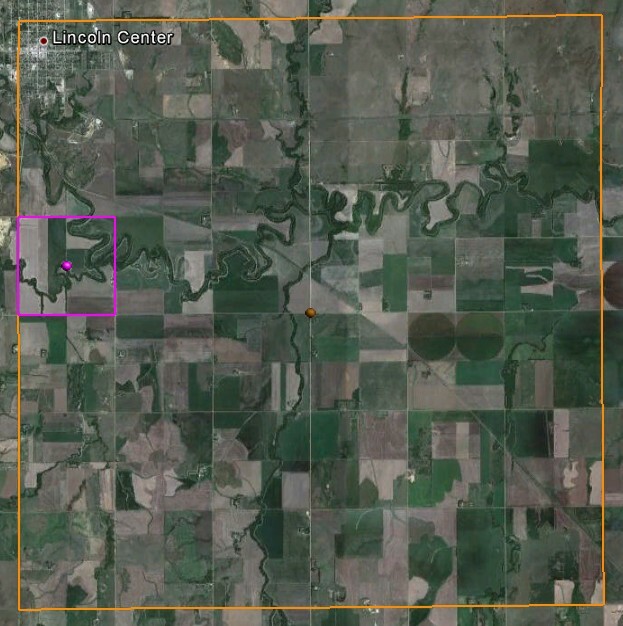 You'll see an overlay with a large square (orange) and a smaller square (purple) that outlines the ancestral land. As you can see, Google Earth can do far more than just fly you to your present home or give you a bird's eye view of Washington, D.C. monuments, national parks, and famous landmarks. 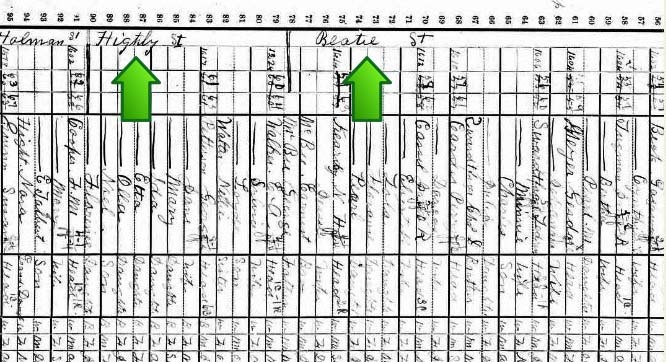 It can be an invaluable tool in your genealogy research - particularly when you want a visual record of the places your family lived. Want to do even more with Google Earth? Use it to see the evolution of U.S. county boundaries, which can help you with your research! "Finding Historical U.S. County Boundaries Using Google Earth" has all the information you need to get started.